It’s that time of year again! 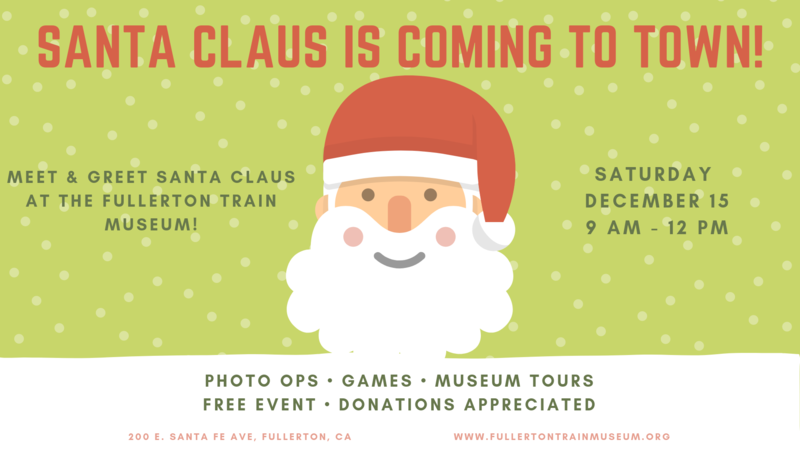 Santa and Mrs. Claus are making their yearly visit to the Fullerton Train Museum. The museum will be decked out in its holiday best and Santa will be available for photos in our 1950s lounge car. There will also be tours of the cars, games, and crafts. This is a great opportunity to get a unique photo of the family with Santa and Mrs. Claus in a vintage railcar, so don't forgot those cameras! January 13 ROC Work Party & Free Railcar Collection Tours 9 a.m. at the Fullerton Train Station. Movie at 6 p.m.
January 23 H&MC Meeting 7 p.m. at the Benash household. February 27 H&MC Meeting 7 p.m. at the Benash household. March 27 H&MC Meeting 7 p.m. at the Benash household. April 14 ROC Work Party & Free Railcar Collection Tours 9 a.m. at the Fullerton Train Station. Movie at 6 p.m.
April 24 H&MC Meeting 7 p.m. at the Benash household. 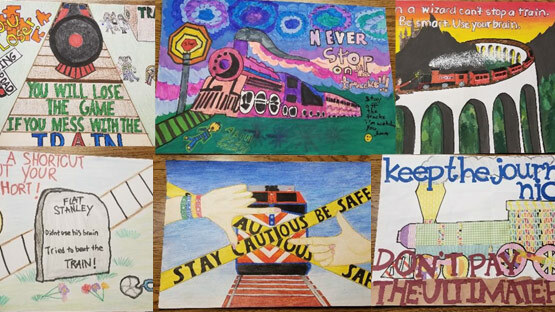 May 5 20th Annual Railroad Safety Poster Contest Display Visit the Museum as we transform it into an art gallery and view all the posters from more than 75 students – May 5, 2018, 9 a.m. – noon. Winners presentation at 10:30 a.m.
May 22 H&MC Meeting 7 p.m. at the Benash household. June 26 H&MC Meeting 7 p.m. at the Benash household. July 14 ROC Work Party & free Railcar Collection Tours 9 a.m. at the Fullerton Train Station Movie at 6 p.m.
July 24 H&MC Meeting 7 p.m. at the Benash household. August 28 H&MC Meeting 7 p.m. at the Benash household. September 25 H&MC Meeting 7 p.m. at the Benash household. 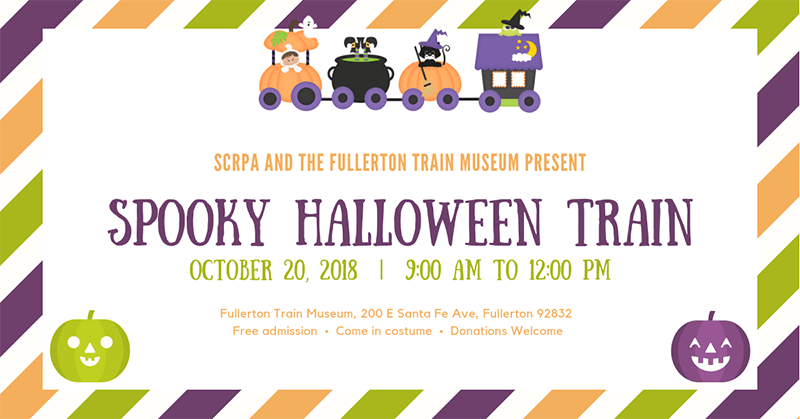 October 13 ROC Work Party & free Railcar Collection Tours 9 a.m. at the Fullerton Train Station Movie at 6 p.m.
October 20 Spooky Halloween Train Calling all ghosts and goblins! Come down to the Fullerton Train Museum between 9 a.m. & noon. Come in your best Halloween costumes and enjoy trick-or-treating, games, a coloring table, and photo opportunities. Beware, our very old rail conductor could be lurking behind a door or closet just ready to hand out treats! October 23 H&MC Meeting 7 p.m. at the Benash household. November 27 H&MC Meeting 7 p.m. at the Benash household. December 25* H&MC Meeting 7 p.m. at the Benash household. *This event date may be changed.